PAUL RICKETTS is an award-winning comic who since 2005 has been entertaining audiences across the UK and beyond. Since starting as an MC in his own London Comedy Club, Paul has developed into a much sought after performer on the comedy circuit. His intelligent humour focuses not only on sharp observations from life, but also racial, cultural and satirical subjects, intermingled with strange tales of ordinary madness. Sometimes silly, serious or surreal, sometimes autobiographical, political or near the knuckle - but always funny! 2007: Part of a late night show as part of the Laughing Horse free festival, performed at the Smirnoff Underbelly and MC-d 'Pretty Dirty Things' which received a four star review from ONE4REVIEW.COM. 2008: Paul hosted 'Up The Arts Comedy Lock-In' to packed audience as part of the PBH Free Fringe and performed his first solo hour show 'Paul Ricketts & Buff Wood - Wood Pushers' awarded five stars from THREE WEEKS. 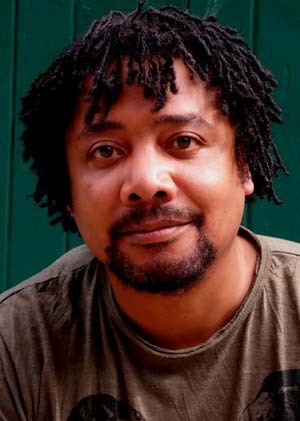 2009: Paul's Edinburgh show 'Cutter’s Choice’ went on to be performed in Islington schools as part of their Black History Month Events, The Hen & Chickens Theatre, London, Leicester and Brighton Fringe Festivals - winning the FRINGE GURU EDITOR'S CHOICE AWARD 2010. Also performed in 2011 as the closing show of the 'Art As A Weapon' black history festival at Theatro Technis, London. 2010: Paul's Edinburgh show 'Kiss The Badge, Fly The Flag!' received the 'Must See' award from THE STAGE, five stars from REMOTEGOAT.CO.UK and four stars from THREE WEEKS. This show was performed at Cambridge University's 'Festival of Ideas' in October 2011. 2011: Paul did one preview performance of his storytelling show "West End Story" in Edinburgh. Amazingly it was nominated for Best Free Show, Best Comedy Performance and Best Moment in the Edinburgh DARKCHAT awards. 2010: Asked to appear in a sketch in Stewart Lee's Comedy Vehicle - unfortunately cut due budgetary constraints. Performed in BBC 'The Gagsters' pilot and involved in the BBC Sitcom Script Reading/Development Group.